1. The purchase of a Skinth OG sheath in 2012. This sheath was made by the Canada-based designer Eric Au and is well worth the money (~ 40 EUR). 2. 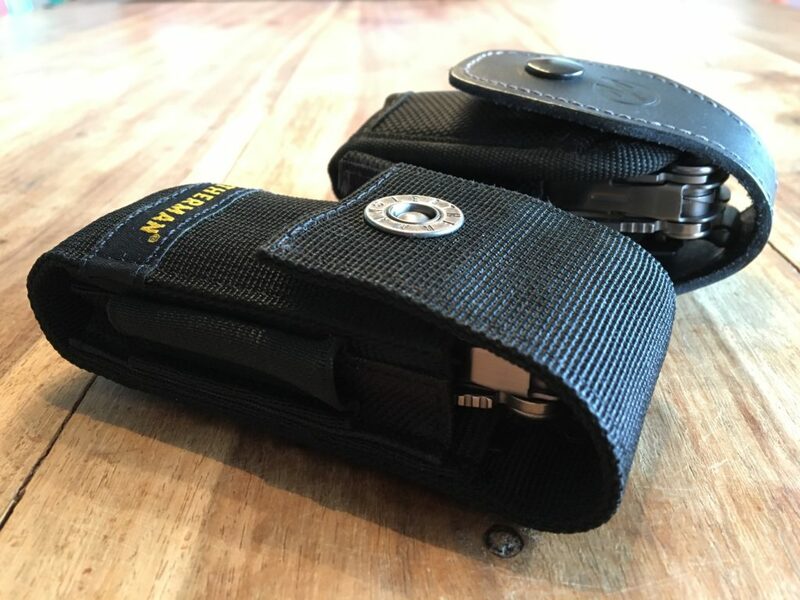 I switched from carrying a bigger Leatherman (LM) multitool to a Leatherman Squirt PS4 which is a tiny little multitool that sits in the 5th pocket of my jeans. My initial desire for the ultimate sheath began in 2004 when I got the (back then) updated LM Wave 2004 which was a massive improvement over the „Original Wave“. Bigger, wider, much more useful on the one hand, but on the other hand it came shipped with an awful Leatherman sheath made out of stiff leather. Now in 2018 it is still very stiff, not very useful. And sadly, the current Wave as sold in this Shire still comes shipped with a really stiff leather sheath that may look durable, but is a pain to wear on the belt. Who uses these sheaths anyways? And why can’t they make great leather sheaths even when they carry the “leather” word in their name? The brown version from the original Wave (pre 2004) was great and all current tools should come shipped in them. Why? Because a good sheath is just as important as the tool itself. These tools come with extra bitsets and – with LedLenser belonging to the Leatherman set of brands – a multi-tool may often come along with a modern and thin LED flashlight. I am currently using the Olight i3E and the Olight i3T along with my Leatherman tools. These are great lights that run on AAA batteries. 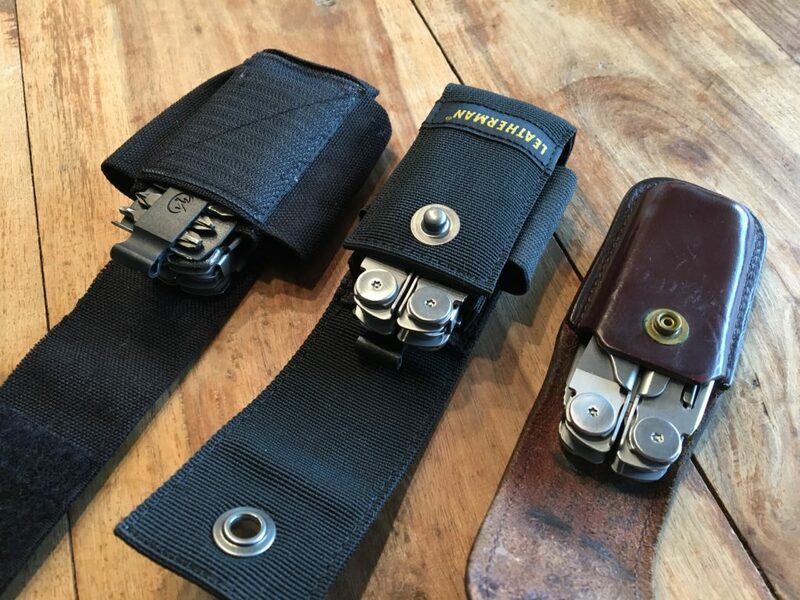 I blogged about this quest for the ultimate Leatherman sheath before in 2005 and in 2010 when I made my own sheath. Making my own sheath seemed to be the most plausible thing to do because I couldn’t find anything better that was commercially available. The first one in 2005 was made out of green canvas with blue Brokat material stuck on it (really odd, but there’s another story to this material, also see this collection), the second one in 2010 I made out of leather which I later on painted (which was a mistake, imo). Working with leather is just wonderful. 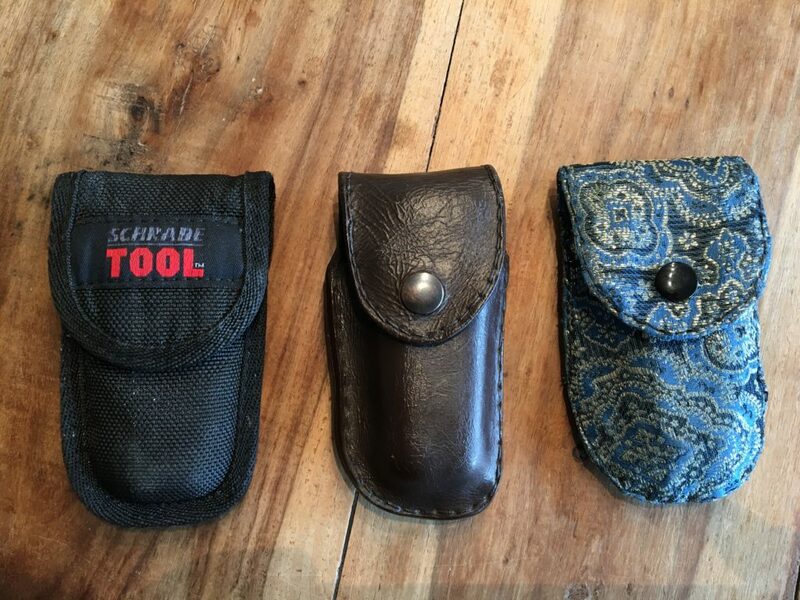 Somewhere in between these two I also modified a larger “Schrade tool” sheath so that it would fit the LM Wave. Then, in 2012, I switched to the Skinth and later on the Squirt PS4 solved all these “matters of carryology”. My own sheaths: A modified Schrade tool sheath, my own leather sheath ex 2010 and the first sheath I made in 2005. 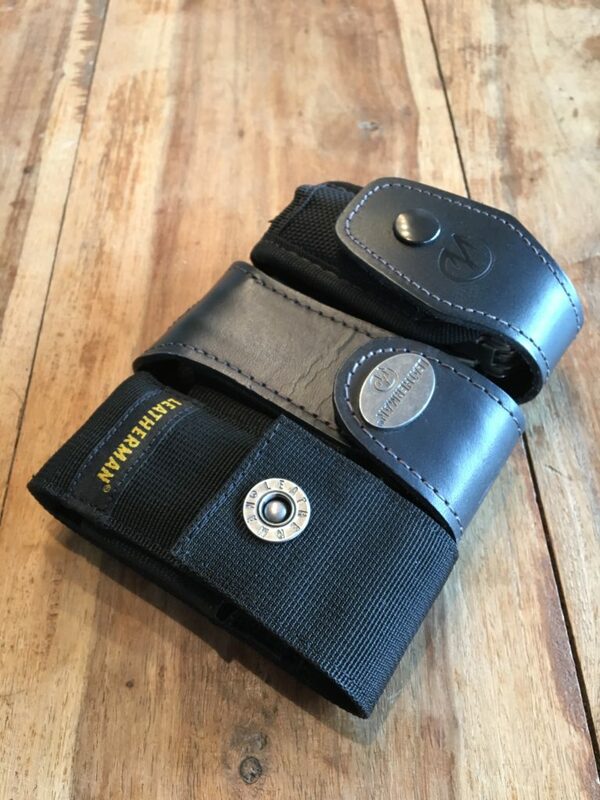 This new 2017 or 2018 Leatherman Nylon sheath is sold for about 20 EUR in Germany, and so I ordered the “medium” size which is one of three sizes along “small” and “large”. There is room for one bitset (= one plastic holder for bits, not two) behind the tool in a rubberized slot, and there are two open (bottom open) rubber sleeves for extras like the aforementioned lamps, a pen and/or the bit extender. One of the sleeves appears to be a bit wider, so in my case this is where the flashlight goes into, whereas the front sleeve accommodates a pen. The main compartment provides room for my LM Wave or Charge TTi, and there’s enough space for even a bigger tool as my finger fits in between the tool and the cover. So is this “new nylon sheath” any good? YES! 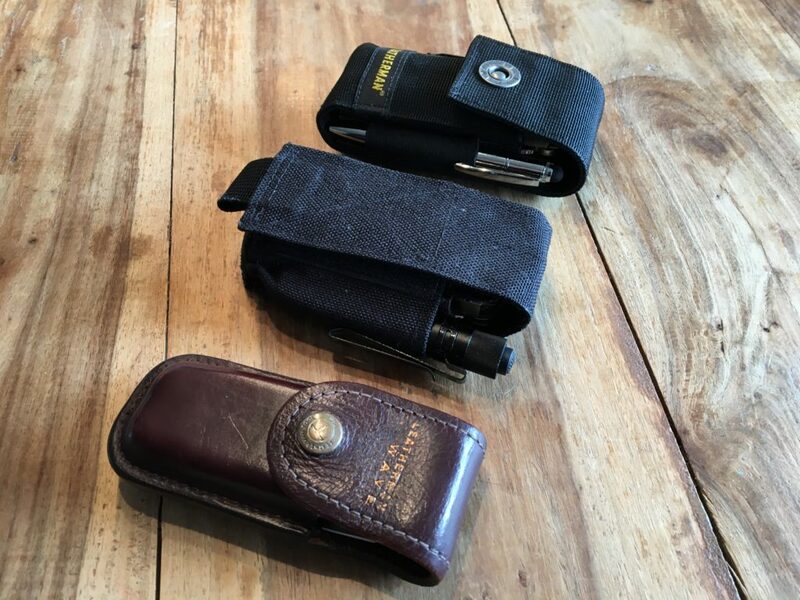 It is marvellous and I would call it the BEST cover Leatherman ever made after the brown leather sheath that was made for the Original Wave. I rated this 5/5 stars on Amazon, would buy it again anytime and hope they will produce it for a very long time. Also, this version finally enables me to recommend a good sheath from Leatherman, and in the past I could only do that for the Skinth OG. It is well rounded around the edges, doesn’t get too bulky (= the original reason for the slim Skinth OG) and is still very durable. It has the right size, the right weight and feels like he real deal. I instantly liked it, and that already says a lot about this sheath. 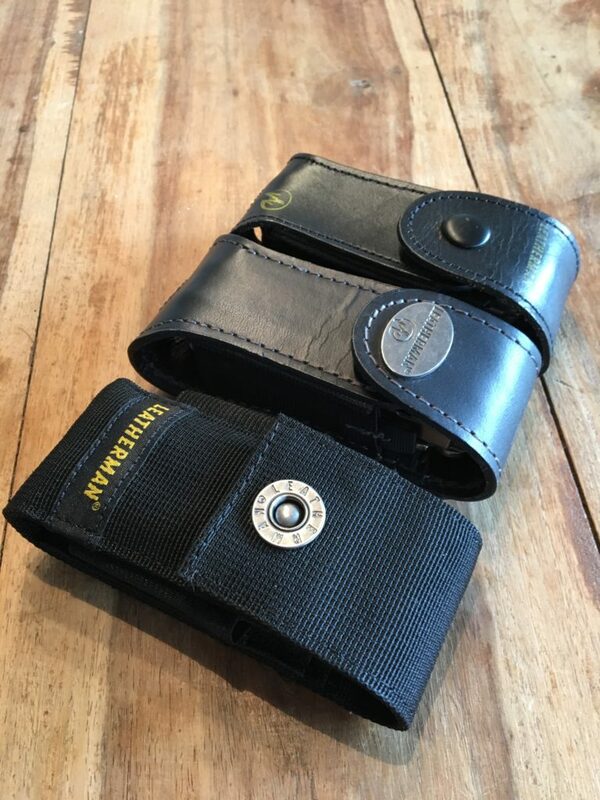 If you are looking for a better sheath and haven’t tried this one yet, please give it a try. It may only be made in China, but it is the opposite of what Shanzhai stands for and is of really good quality. Original Wave leather sheath, Skinth OG, LM Nylon sheath: The Skinth OG is still slimmer than the LM Nylon sheath. There is a relatively new Nylon sheath made by Leatherman which is better than most of their leather sheaths. It also competes with the Skinth OG sheath which costs twice as much. 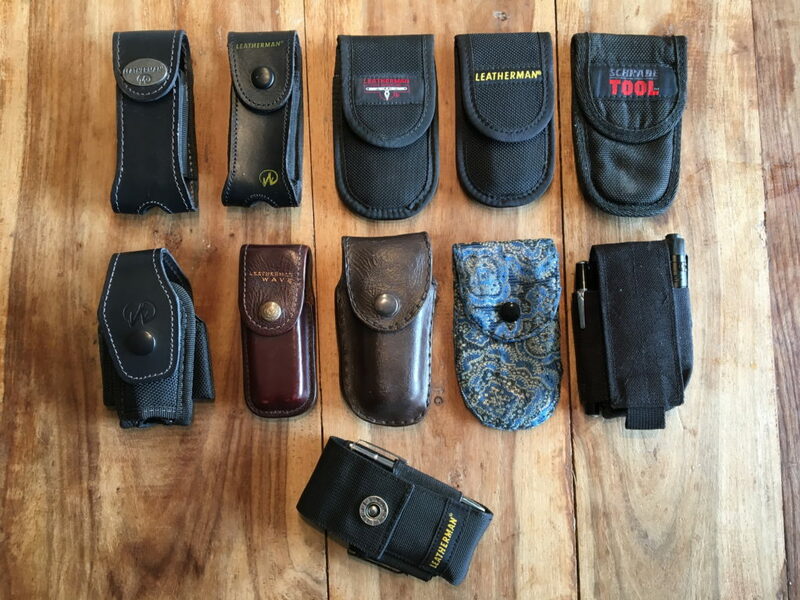 The best sheath depends on personal preference: some prefer the nylon style, a bigger sheath that has room for more tools, while others prefer no sheath at all. 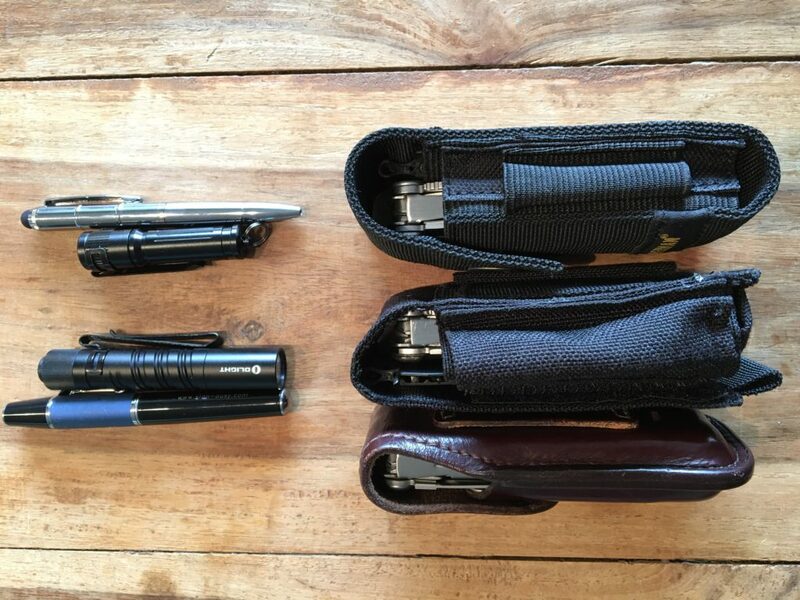 I don’t know anyone though who actually likes the bulky (black) leather sheaths that Leatherman sells. The only nice leather type is the brown one. Sheaths are just as important as the tool.